Total Video Converter for Mac is a powerful video Converter which enable you trim your videos to desired clip and convert them to the suitable fomate at high speed with perfect output quality.Then you can save your favorite clip in Mac with less space. Current Page:Home > Mac Total Video Converter > How to TRIM video/audio to desired clip? How to TRIM video/audio to desired clip on Mac? Do you have some videos/audios that you only want to save your favorite clip for saving the space? And have you been looking for some utility that you can cut the bad clip in your video/audio? How can I do if I want to trim my video/audio to get my desired clip? Which program can help me do this? This tutorial is show you how to TRIM video/audio to desired clip on Mac OS X.
Click the "Add" button,choose the video/audio to be converted.Or directly drag & drop the files from explorer. The video/audio will be added. When you import a video to Toatl Video Converter for Mac, you could find Edit icon on each video! Click this icon to access the edit interface to edit the video! Tap "Trim" on the edit interface, you will get a interface to trim the video! The video will by played automatically! You can trim the video/audio to get your desired clip. All you need to do is setting "Start Time" and "End Time",then click "Done"
You can set the start time of your desired chip by chicking the button that I sign with "red" circle. You can set the end time of your desired chip by chicking the button that I sign with "red" circle. When you set the starttime and end time of your desired chip ,you can see a interface like below. Click "Done" when you set the "Start Time" and "End Time" of your desired clip,you will back to the Main Window. Then Click "Convert" and wait for a few minutes. When the conversion finished, the Destnation folder will be opened automatically.Also,you could use "Auto Start" and "Auto End" to trim your video/audio. "Auto Start" will trim the video/audio from the beginning and "Auto End" will trim them to the end. 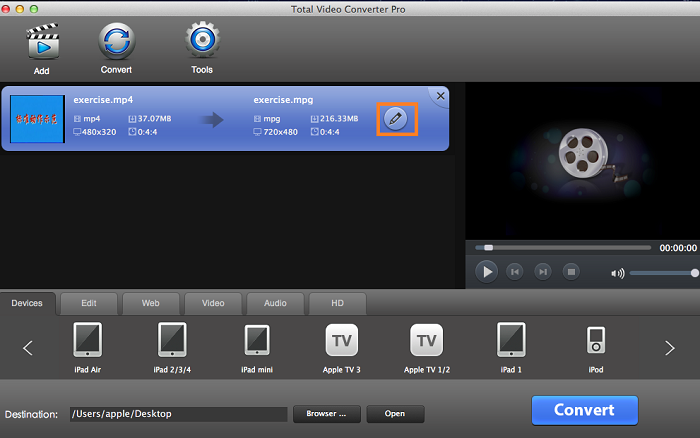 The screenshots of Total Video Converter for Mac. Supported formats by Total Video Converter for Mac? How to burn DVD on Mac? How to make your movies special on Mac? How to combine video clips on Mac? How to trim video to your favorite clip on Mac? How to convert mov to webM on Mac? How to convert video to html5 webM on Mac? How to convert video to HTML5(OGG, WebM) on Mac? How to convert video to mp3 on Mac? How to convert video to mp4 on Mac?